In EVERY color you can think of! Colorful bridesmaid flip flops make a fun keepsake gift for the whole bridal party, perfect for beach weddings or just dancing in flats. High heels may look fabulous during the wedding ceremony, but they aren't overly practical when it comes to dancing the night away. 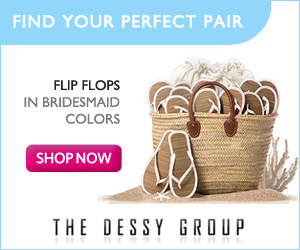 If you're having a more casual wedding reception, why not get some cool and trendy flip flops for your attendants? Not only are they comfortable, they make a great keepsake gift for your bridesmaids - and they're even available in mens colors too! I just love these colorful flip flops that come in more than 50 different shades. The upper is made of silky smooth matte satin, the soles are rubber and the insoles are made of bamboo. They make a perfect bridesmaid gift as they come complete with a matching chiffon pouch and silk drawstring tie closure. And they cost just $15.00 per pair! See the product opposite in close up detail complete with matching chiffon bag on this flip flop product video. Whatever your wedding color theme, you are sure to find a matching flip flop in this collection. AND, if you are looking for exact color matches on other accessories, read on! The pretty flip flops above are part of a complete range of accessories, all available in matching colors. They include headbands, clutch bags, accessories for the men like ties and matching waistcoats and much much more. If you want everything, and I mean EVERYTHING to be totally color co-ordinated on your big day, plus quality at a great price, see the entire range of co-ordinating bridal accessories here. Over 50 colors of Gorgeous Flip Flops! Tip: Find co-ordinating accessories like bags, headbands, ties, parasols and more in EXACTLY the same color for perfect color matching.